By all accounts, 1988 was a tidal wave in the history of Boston’s alternative music scene. The same year that the Pixies unleashed “Surfer Rosa,’’ Throwing Muses, Galaxie 500, and Blake Babies were all courting national attention and college radio play. And then there was Ed’s Redeeming Qualities. You’ll be forgiven if your memories are a little fuzzy about this acoustic ensemble that came together almost by accident in early ’88. People didn’t know what to make of the band — neither then nor now — but anyone who saw Ed’s, at long-gone clubs such as the Rathskellar, can probably tell you a good story about that night. Ed’s was the prototype for the little indie band that could, a cult favorite particularly embraced in Boston even though it formed in New Hampshire when its members — Carrie Bradley, Dani Leone, and Neno Perrotta — were graduate students in writing programs. Dom Leone, Dani’s cousin, later joined the band, but his tenure was short; he died in 1989 from cancer. After two years in New England, the group uprooted to San Francisco and survived various lineup changes until it officially disbanded in 1996. No one predicted Ed’s would be returning for a hometown show more than a decade later, but that’s what’s happening tomorrow night at T.T. the Bear’s. At the suggestion of Ray Halliday, the band’s former manager, the group’s three remaining original members will reunite for a one-off performance that coincides with the first-ever digital release of its early work with Dom. “Ed’s Redeeming Qualities,’’ “Ed’s Kitchen,’’ and “Guess Who This Is,’’ all of which were previously released only on cassette, will be available at the show. Even in Boston’s vibrant music scene at the time, Ed’s stood out. Similar to Jonathan Richman, they wrote and played amusing story-songs with a casual charm that could sometimes be mistaken for naiveté or pretension. Bradley remembers agonizing over the task of trying to define Ed’s sound back in those days. “At this point in my life, I take an easy out and I usually call it garage-folk, with an emphasis on storytelling and black comedy and poignancy,’’ she says. And who, exactly, was the audience for such a band? Ed’s wasn’t quite folky enough for the purists, and yet it didn’t exactly rock out, either. “We did pretty well with the rock crowd because we had a rock spirit even though we were acoustic and had limited talent on our instruments,’’ says Bradley. Deal later immortalized the band when the Breeders covered “Drivin’ on 9,’’ an early Ed’s song, on “Last Splash.’’ She says it’s so popular that they still perform it in concert. As other local bands seemed primed for a breakthrough, Ed’s stayed true to its low-key roots, selling homemade cassettes from the stage and bantering with the audience as if no boundary existed between them. In place of Internet buzz, they depended on fanzines and local radio play. “Lawn Dart’’ was a major hit — “at least in Kenmore Square,’’ notes the press release about the T.T.’s reunion show. 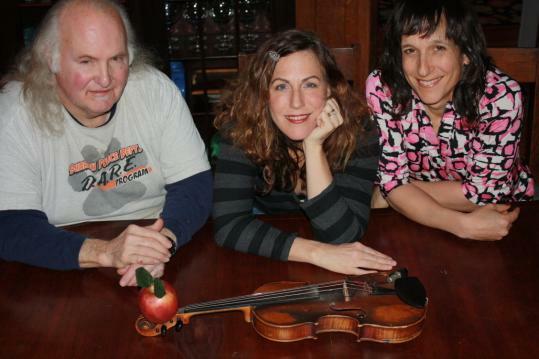 As she and Leone and Perrotta gear up for their Boston homecoming, their first local show since 1996, the momentous occasion has also posed a dilemma for Leone, who used to be known as Dan Leone before undergoing a gender transition. But Leone also asserts she’s a more confident musician and singer, and that fans of Ed’s probably won’t be that shocked. And if there’s a lesson to be learned in the story of Ed’s Redeeming Qualities, it certainly hasn’t been lost on Bradley. At: T.T. the Bear’s tomorrow, 6 p.m. Tickets: $12.